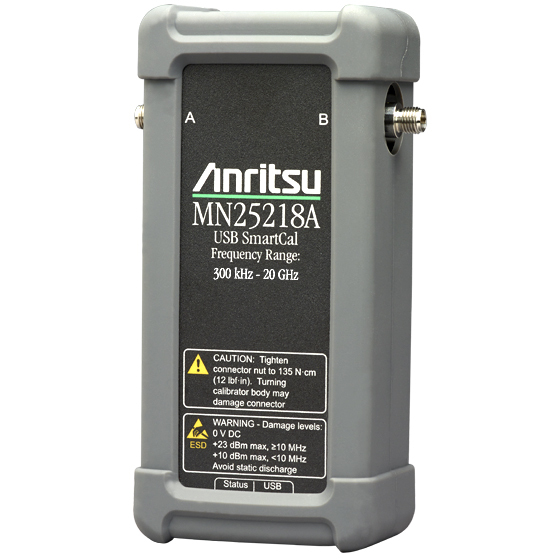 The SmartCal MN25218A is a series of 2-port auto calibration units covering a frequency range from 300 kHz to 20 GHz. The MN25218A comes with K(f) connectors on both ports. The MN25218A delivers automatic, fast and error-free calibrations for any ShockLine VNA. The SmartCal automatically powers on via an USB connection and loads calibration kit coefficients from on-board memory into the ShockLine software. The SmartCal is ready to use immediately after detection by the VNA because it doesn't require warm-up.